I teased y’all with a preview pic of the dreamy dessert on Facebook last year (have you liked the Healthy Indulgences Blog Facebook page yet? ), but ended up too busy last season to post it. Note: These portions are massive, and for display only! I got the inspiration for using shot glasses as serving dishes after a visit to Seasons 52. It’s an innovative restaurant with gluten-free options and fresh, seasonal ingredients with an ever changing menu. Amazingly, all of its dishes are under 400 calories! 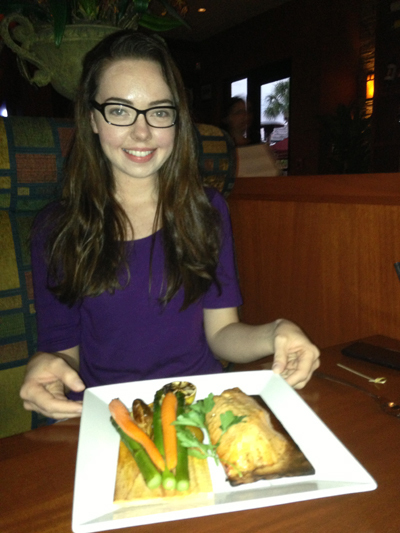 Yours truly, at Seasons 52! I was exhausted after taking a big, scary standardized test, but feeling much better after the delicious salmon, roasted veggies, and a chocolate chip cheesecake dessert shot. 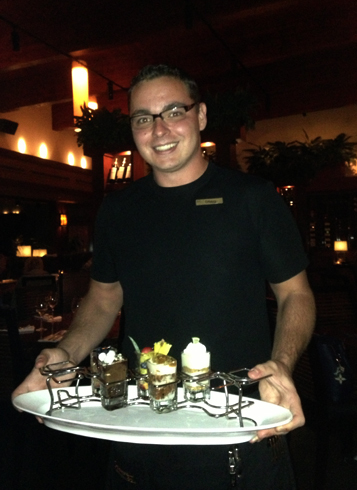 Our server, Robert, provided us with top notch service and ton of helpful info about how the dishes were prepared. Check out the shot glasses full of a smorgasbord of low calorie delights! They were not low in sugar, but I indulged because it was a triumphant moment. -The crust comes together in a food processor. The filling is whipped up with a hand mixer. Fill glasses with crust crumbs, top with filling, and bop the dessert tray in the fridge to chill. Bada bing, bada boom! -To keep this treat gluten-free, use gluten-free oats, which you can purchase here or at a health food store. Some grocery stores even carry Bob’s Red Mill gluten-free oats. Look for the purple label. -To make this treat grain-free, you can substitute unsweetened, shredded coconut for the rolled oats. Keep in mind that this will increase the calories per portion, and will add a coconutty flavor to the crust. 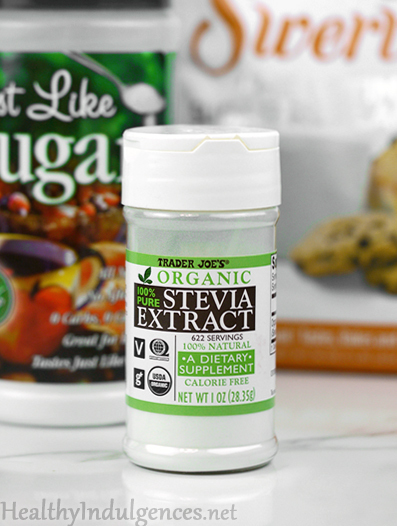 -You can use Truvia or my homemade, all natural sweetener blend (stevia + erythritol) to make this recipe diabetic-friendly. Alternatively, substitute xylitol for the erythritol. See how to do that substitution here! -You can use raw, mixed nuts in the crust if you’re worried about the freshness of canned mixed nuts. Just roast the nuts yourself, and let them cool before processing them in the food processor. If you go this route, you’ll need to add 1/4 teaspoon sea salt to the crust. -If you want to get the silky smooth texture of the filling you see in the second photo, use Clover Valley brand (found at Dollar General) canned pumpkin. Libby’s brand is a bit too chunky in texture, so it clogs up the piping tip and produces uneven, erratic swirls, as seen in the top photo.You could also use a hand blender with a glass measuring cup to puree the Libby’s brand pumpkin to a smoother consistency before using it in the filling. -To get the most accurate carb count, weigh the ingredients using a kitchen scale. I plugged the weights of ingredients into MasterCook to get the nutrition facts posted below. The high ratio of fat to carbs make this an S treat on the Trim Healthy Mama plan. -The brand of stevia I’m currently using and recommending is Trader Joe’s Pure Stevia Powder, pictured below. Check your copy of the Healthy Indulgences Cookbook for an updated version with a photo of the new stevia this week! This no bake cheese is perfect for your Thanksgiving dinner guests watching their sugar intake! 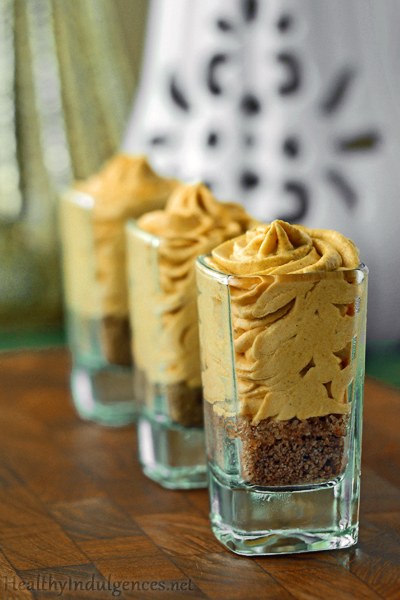 I recommend portioning out the crust and filling into shot glasses due to the richness of this decadent treat. Grind up 1/4 cup Truvia or natural sweetener blend in Magic Bullet or coffee grinder into a powdered sugar-like consistency. Add oats, mixed nuts, cinnamon, and powdered Truvia (or powdered natural sweetener blend) to food processor. Process for 30 seconds, or until you produce a coarse meal. Spoon mixture into serving glasses. Grind up 7 Tablespoons of Truvia or natural sweetener blend to a powdered sugar consistency. Beat cream cheese, pumpkin, powdered Truvia (or sweetener blend), pumpkin pie spice, and vanilla with a hand mixer on medium speed until evenly blended. Wipe off beaters, and add heavy cream to a mixing bowl. Beat heavy cream until stiff peaks form. Be careful not to overbeat to the point that cream appears to have a grainy consistency. Fold whipped cream into pumpkin pie filling until white streaks disappear. Spoon or pipe topping into serving glasses. **For best results, purchase mixed nuts that are peanut-free. If using raw mixed nuts, toast them in a 350 degrees Fahrenheit oven for 5-10 minutes, stirring twice during the process to ensure even toasting. Per serving (1/12): 277 Calories; 25g Fat; 6g Protein; 11g Carbohydrate; 3g Dietary Fiber; 48mg Cholesterol; 178mg Sodium. Per serving (1/14): 238 Calories; 22g Fat; 5g Protein; 9g Carbohydrate; 2g Dietary Fiber; 41mg Cholesterol; 153mg Sodium. For the entire recipe: 3326 Calories; 301g Fat; 75g Protein; 126g Carbohydrate; 32g Dietary Fiber; 574mg Cholesterol; 2136mg Sodium. 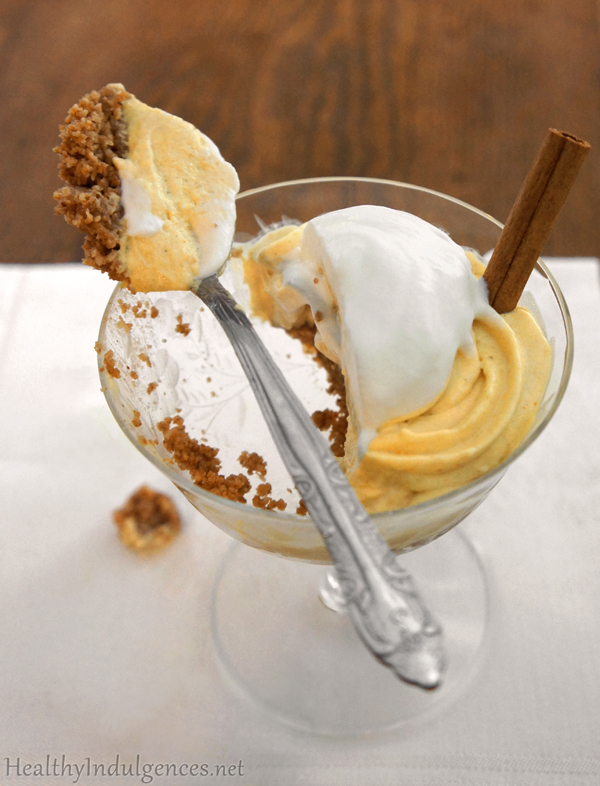 6 Comments on Sugar-Free Pumpkin Cheesecake for a Sweet Thanksgiving! I think you mean 350 degrees Fahrenheit, not Celsius, for roasting the nuts! Brian, thanks for catching that! Amended the recipe. 3 ounce or 8 ounce cream cheese package? This looks delicious – thank you for sharing! Do you have any suggestions for how to make the crust without nuts? I have an allergy! Yes, what size cream cheese? I have a dairy sensitivity. Can this be made with coconut cream instead of heavy cream?